This quilt was made for my dear husband by our triplet daughters and myself a couple of years ago. 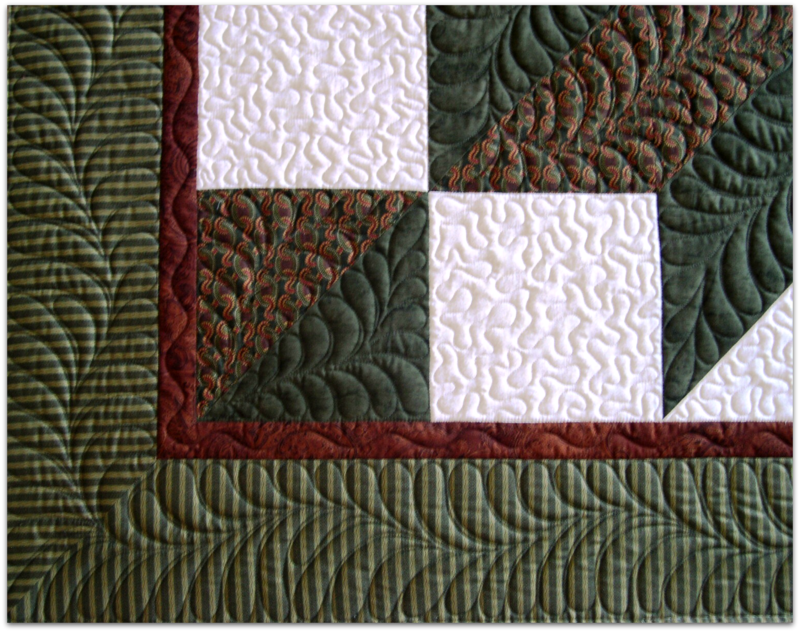 A traditional quilt block, made with giant half-square triangles (no Y-seams! ), we made the quilt in 1-1/2 days! Each of us put together a quarter of the quilt, and I pinned and pressed as the girls helped to stitch the borders. We finished the top in time to wrap it and give it to him for his birthday, unquilted; but he understood, since there were other 20 unfinished quilt tops in the queue waiting for the machine quilter (me). Evan loves the design, the clean lines, the colors, the fabrics, the fact that it is called a "Carpenter's" Star (since he is a carpenter himself! ), but he especially loves that all four of his girls made it just for him! He folded it up, held it on his chest, then fell asleep with it on the couch. Oooohhh! A tender moment. It was a PERFECT gift for him. Within a couple of days, I quilted it just like he wanted, then the girls and I grabbed our needles and thread and went to town on the binding. He loved it, and we loved making it for him! That's what quilting is all about. Making a quilt is an emotional process; personal and precious. 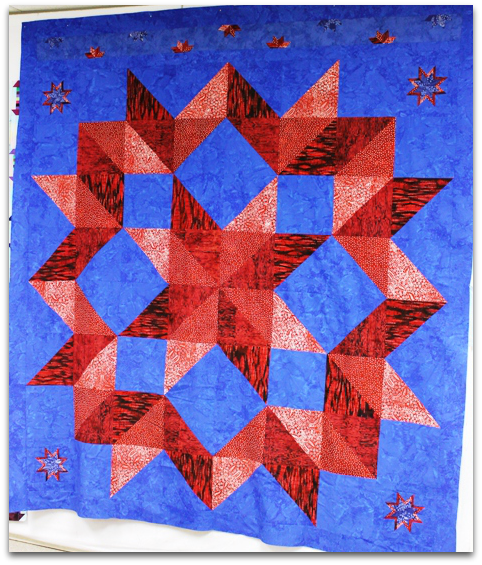 Thinking about my husband, planning the quilt, then making it for him was like infusing the quilt with love. It made the final product a creation from the heart, not just something thrown together, though it did go quickly. The finished quilt is a conduit of our love for him, and that is something worth far more than anything money can buy. I love this post Deonn. The quilt is beautiful and you and the girls making it for your hubby makes it even more beautiful. You summed up what making a quilt is perfectly. I agree with Angie! Such a beautiful story. I felt that way making ones for family as well! 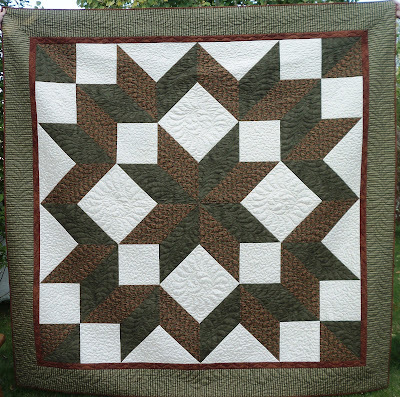 A great man's quilt, but a quilt made with love from people who mean a lot to him. How special! Thank you for sharing. What a wonderful story - so touched the heart! 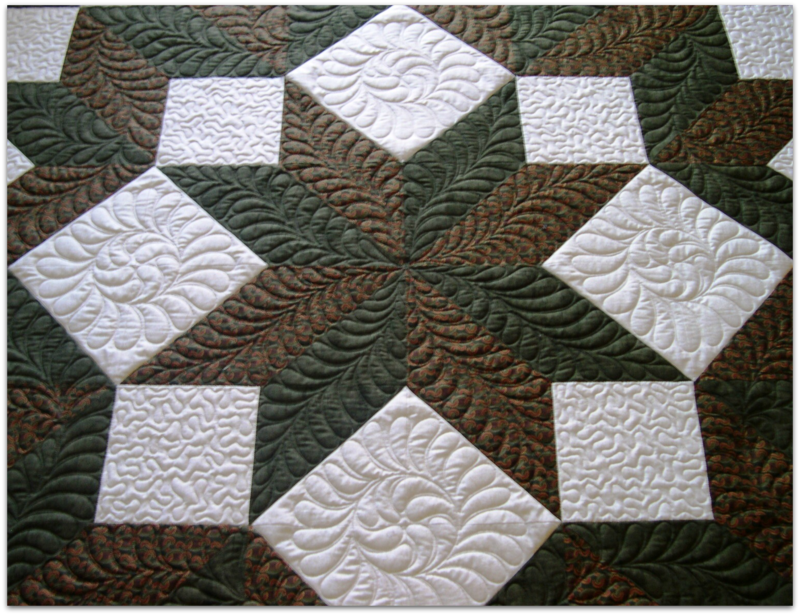 A beautiful quilt beautifully quilted- thanks for the pattern link. 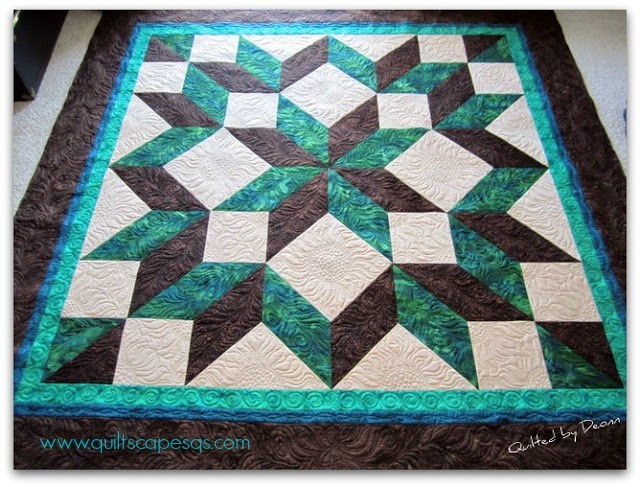 The quilting is fabulous and what a wonderful story. 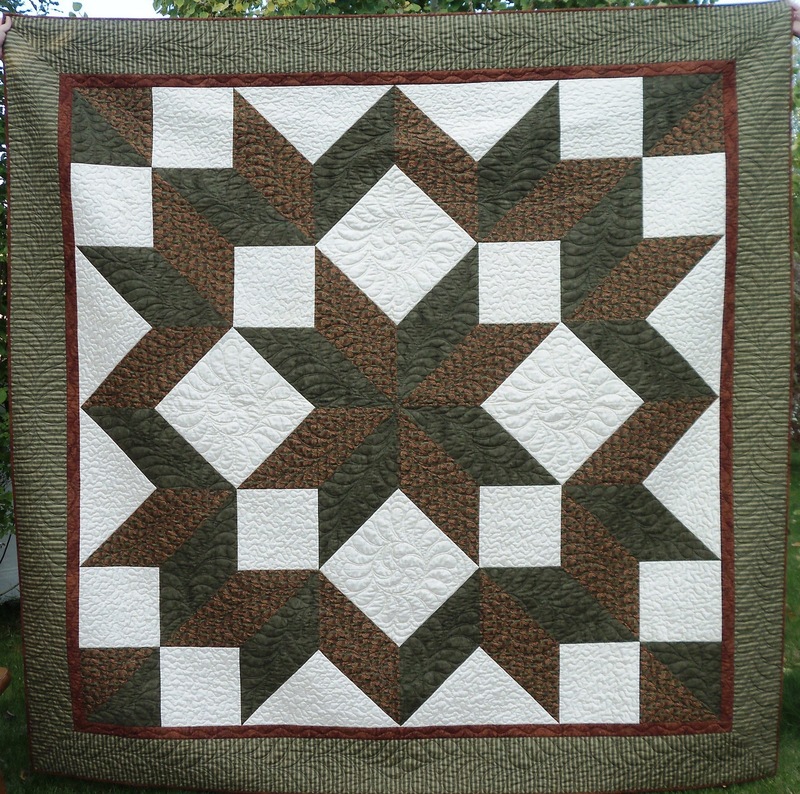 great work on the quilting! 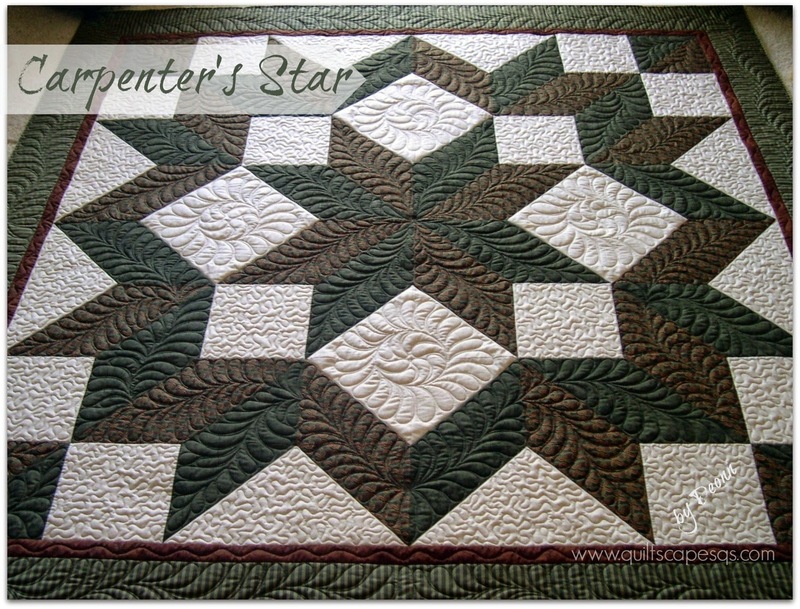 I love the Carpenter's Star pattern and reading the story makes it extra-ordinary! I've just ordered several of your patterns and can't wait to 'get to work'. I wish I could join a class but Utah is just tooo far away. Hmmmm. Have you thought of having an online course of some sort? 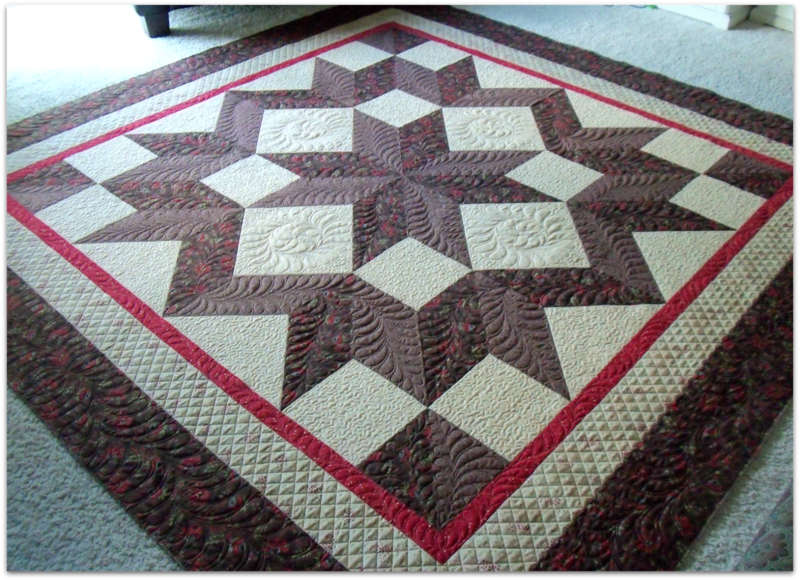 It is a beautiful quilt and what a lovely sweet story to tell about it. What a sweet story and an amazing quilt! Your post has me misting up. So beautiful- quilt and story behind it. Thank you for sharing. Wow, it's stunning. Sometimes simple design really is the best, isn't it. Oh, made me tear a bit. It's so nice and the story is great! What a special family time. Welcome Magyrországról. I really like your quilt. Beautiful colors, and stitching. I have three granddaughters:)I better get busy and buy the pattern. Beautiful quilt and story. Thanks for sharing your talents. Beautiful quilt and lovely story!